I don't often wear a hat, knitted cap or toque in the winter since much of my outside excursions are between car and building therefore I can manage the coldness without a hat. But truthfully, it's the hair. I prefer not to wear a knitted hat particularly since between the flattening effect and the static electricity it's easier not to wear one. I have no idea if the fact that the majority of body heat is lost through the head is true or not. When I'm out for a lengthy time, walking, cross-country skiing or at a sporting event, a toque is necessary but for the most part I abstain. The closest I get to a head covering is a snood, which I find more adaptable to the weather. I found this snood on Makings of Shanna Tice on Etsy and I prefer the way the "hood" falls into a cowl neckline. 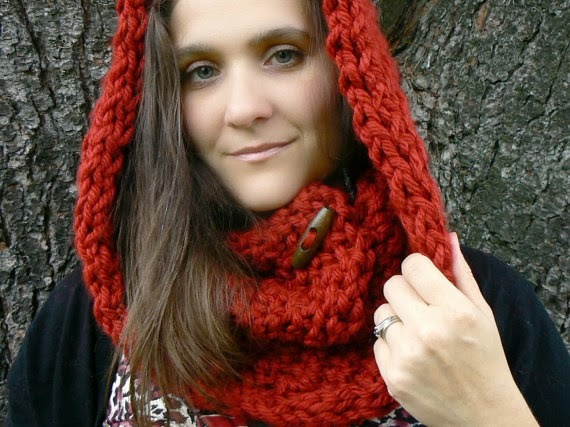 It's an efficient piece since you can pull it up when you need or leave it as a scarf encircling your neck. She has other snoods and scarves (on her Etsy display) with the designers' touch of large wooden buttons. The snood is pulled up from the back, therefore there is less disruption to the hair. NICE: Apparently the secret to wearing a knitted hat is to place it on the head from the back and up, not from the front. You must leave a fringe of hair to frame your face, not pull it all under the hat. It then allegedly just pulls off from the back as well without too much muss or fuss. If you want to see and read more about how to wear a winter knitted hat visit hair on the brain, a blog written by Valerie and dedicated to hair products. NOTE-WORTHY & NICE: Matching was discussed in the previous post about gloves and mittens. The photograph from hair on the brain is a perfect example of inexact matching. The cable knitted hat is a different texture but the same colour as one of the colours in the scarf. I find this type of complementary combining much more chic than the exact matching of similar knitted items in exact colour matches. NEED: I probably need a knitted hat but I won't be out shopping for one until the season is over and I can get it on sale. That is unless I see one that I absolutely must have immediately. It's on my list. NECESSARY: For walking, cross-country skiing and other wintersports and sporting events, the fleece toque or ski mask is necessary. Depending upon how cold it is, I prefer a fleece headband. Just don't get goofy with them - ears and noses on hats are for pre-schoolers. 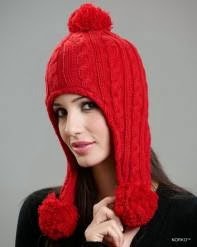 NO THANKS: My least favourite winter hats are those with pom poms and strings - too much like my childhood. I chose not to wear them when I was eight and I still prefer not to. The only reason this one looks attractive is because of the model and not the hat.